Growing up in St. Louis, it's pretty common to find Toasted Ravioli on local restaurant appetizer menus. 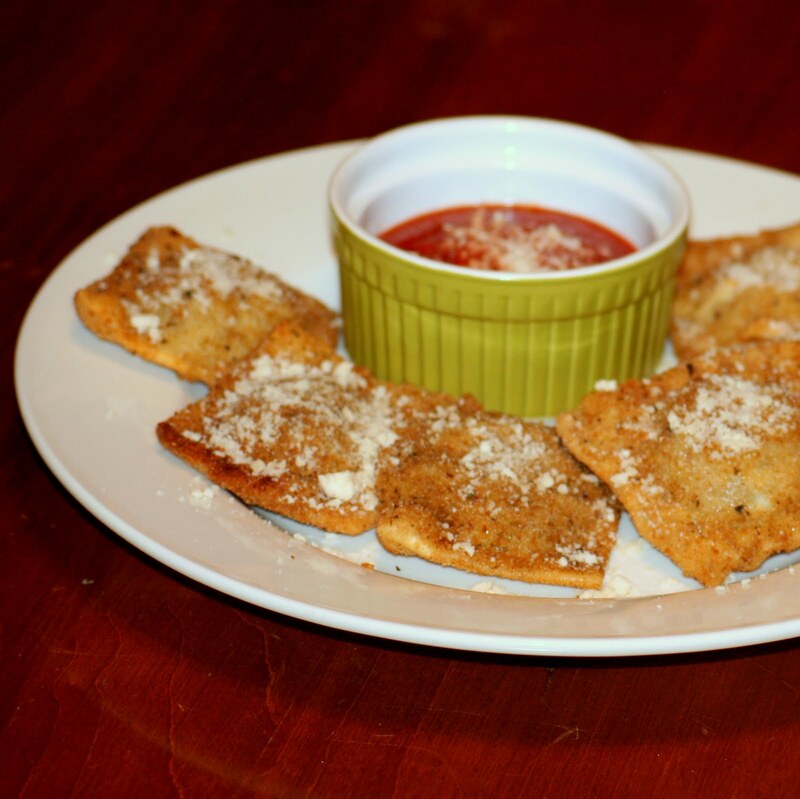 Toasted Ravs (as locals refer to them), are typically meat filled ravioli breaded with Italian breadcrumbs then deep fried until hot and golden, served with warm marinara sauce and sprinkled with Parmesan cheese. At every St. Louis grocery store (or at least the one's I shop at) you're able to find frozen Toasted Ravs that can be baked or fried. They're also available in other varieties, but most restaurants stick with the good ol' fashioned meat filling. I admit that until recently we've always had a package or two of these in the freezer for quick snacks or a small weekend lunch. They're delicious so you can't really blame me. However, as soon as I got my new pasta roller I knew that the first thing I wanted was a big batch of homemade toasted ravs to take place of the prepackaged variety. I am so glad I decided to make these. One batch of fresh pasta and one batch of ravioli filling makes a lot of Toasted Ravs and I can definitely see myself making these pretty often to ensure we always have some on hand! Much like a few of the new recipes I've been sharing these seem to be pretty relaxing to me. Something about repetition and seeing progress in what I'm doing just puts a comforting feeling in me. Sweat onion, garlic, carrot and celery in Olive Oil. Once softened add beef and break up finely. Cook through and drain fat. Add meat mixture and cheese to food processor and pulse until smooth. Add egg and pulse until combined. Gently fold over the other half of the dough. 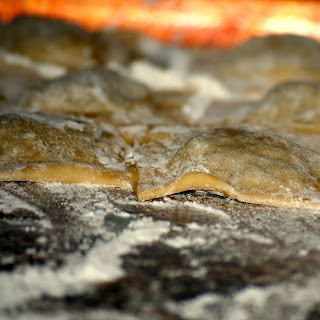 Using a cookie cutter, biscuit cutter or pizza wheel, cut each portion into an individual ravioli. 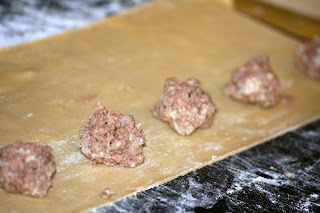 Press around each piece to remove access air and create a seal all the way around the ravioli. 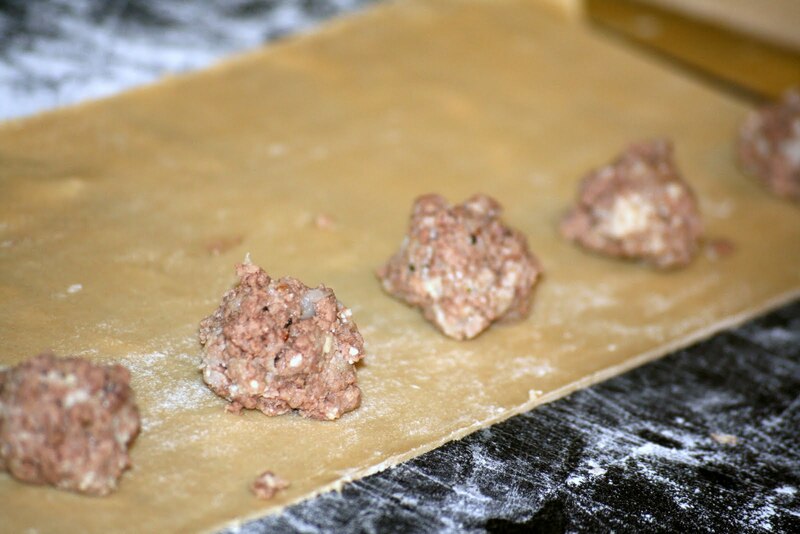 Place each prepared ravioli on a flour dusted baking sheet until ready to freeze. Continue with remaining pasta and meat filling. Once ravioli assembly is finished, freeze in a single layer on flour dusted baking sheets, until frozen through. To bread the ravioli, mix beaten eggs and milk to create an egg wash and put in a shallow rimmed dish. Place breadcrumbs in another shallow rimmed dish. Take frozen ravioli and dip in egg wash, then coat with bread crumbs. Continue until all pieces are coated and then freeze until ready to use, or thaw and fry immediately. To fry, thaw desired amount of ravioli. Preheat a deep fryer to 350 degrees F or heat 2 inches of vegetable oil over medium heat until 350 degrees F. Fry a few ravioli at a time, about 1-2 minutes per side or until golden brown. Drain on paper towels, sprinkle with Parmesan cheese and serve immediately with hot marinara sauce.